The raw materials we use are sourced from all around the world by our dedicated procurement teams. We favour long-term partnerships with our suppliers and work with them to improve the sustainability criteria of our supply chain. We have adopted a Code of Conduct for Partners, which is inspired by major human rights, labour and environmental protection standards. The Code outlines our expectations from all downstream partners on responsible business practices. We require all our business partners to adhere to this policy. This program allows us to ensure that our suppliers respect human rights, labour and environmental standards wherever they operate around the world. We abide by the Kimberley Process system of warranties in order to help eliminate conflict diamonds from industry supply chain. We have put in place a self-regulation initiative for all diamond suppliers, requiring them to refrain from buying or selling conflict diamonds, diamonds from suspect or unknown sources as well as diamonds from countries and regions that have not implemented the Kimberley Process Certification Scheme. Stones not conforming to this scheme would automatically be refused and returned to the supplier. As part of The Journey to sustainable Luxury, Chopard worked together with Eco-Age and trusted partner Lucara and it's Karowe mine in Botswana, to build towards international best practice standards in the mining of diamonds. Chopard released the Garden of Kalahari collection, comprised of diamonds form the Karowe mine, as a demonstration of Chopard’s powerful commitment to best practice in the mining and sourcing of its raw materials, with leadership in the forging of industry alliances and support for local communities in the most remote regions. We are constantly looking at further increasing the overall sustainability performance of our collections and relentlessly work on our key materials and sourcing partners. In this regard, we are proud to feature the black opals used in the Green Carpet collection in 2015. These stones were sourced from a well-established family mining entity in Australia: the Aurora Gems opal mine, situated in the remote outback. The owners have been involved in the opal business all their lives and manage the whole process from mining to polishing and selling of the finished stones. Nothing is outsourced, which ensures that the opals are 100% traceable to their origin. 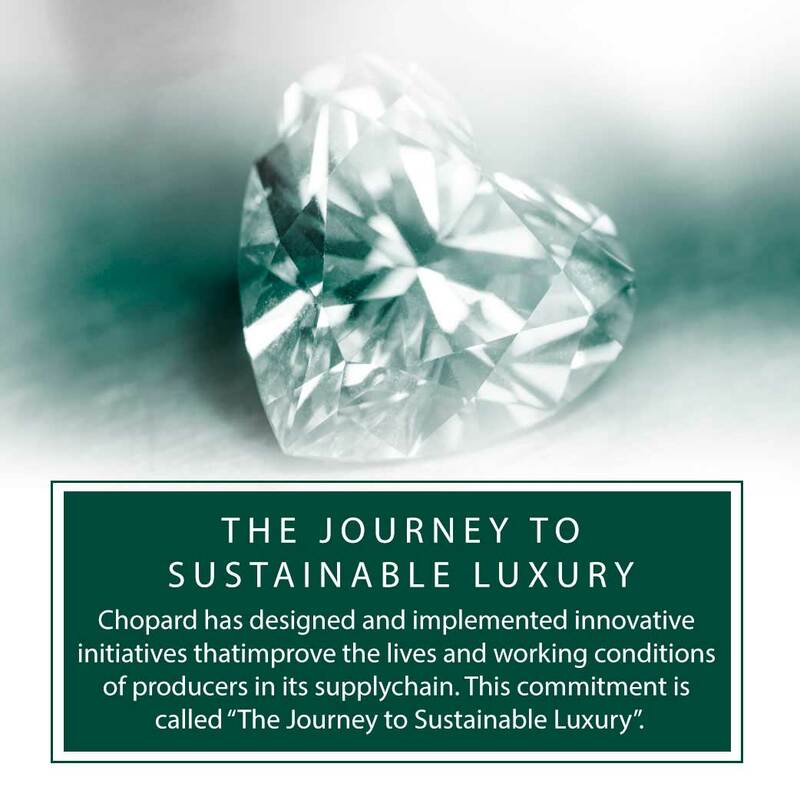 In 2016 Chopard has marked a further milestone in its Journey to sustainable luxury by announcing yet another industry pioneering initiative. To celebrate the beginning of this new phase of The Journey, Chopard developed a unique partnership with Gemfields, the world’s largest producer of coloured gemstones, to unveil a capsule collection of Green Carpet High Jewellery masterpieces featuring responsibly sourced emeralds. 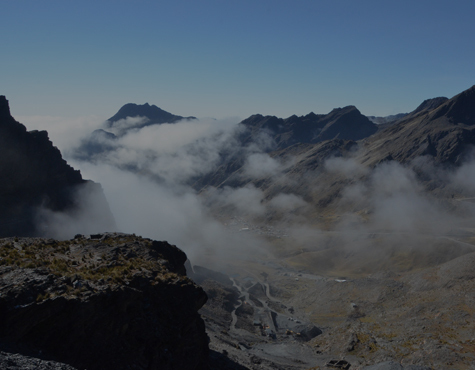 Eco-Age, experts in mining practices and Chopard’s partner in developing The Journey to Sustainable Luxury, validated the mining site and parent organisation against the GCC Principles of Sustainable Excellence. By working together with trusted suppliers, Chopard sets an example of best practice in the mining of coloured gemstones, demonstrates leadership in the forging of industry alliances and continues to support local communities in the most remote regions where these extremely rare raw materials are mined. One of the goals of The Journey is to create sustainable supply chains, including the sourcing of gold, emeralds, opals and more. As part of The Journey, we continually review our supply chains to ensure the procurement of responsibly-sourced stones. Towards this end, and in light of the escalating Rohingya crisis in Burma, Chopard have taken the decision to cease sourcing Burmese gemstones with immediate effect. We take our commitment to the highest standards of ethical sourcing very seriously and will continue to monitor the situation in Burma to help ensure that our principles are not compromised, now or in the future. Chopard steel corresponds to highest aesthetic standards, is highly robust and conforms with applicable industry legal requirements. Further, Chopard has developed its own unique perfectly biocompatible alloy, which minimizes risks of allergies. In 2012, Chopard signed the PSA (Protection Suisse des Animaux) declaration, renouncing the use of types of exotic leather. The Maison will only procure alligator leather from certified farms, accompanied by a corresponding CITES certificates. This is to ensure that captive breeding programmes are organised in a sustainable manner and animal welfare standards are upheld. Chopard is opposed to slavery and human trafficking and is committed to making meaningful improvements to sustainable workplace conditions and business practices including, but not limited to, the prevention of forced or trafficked labour. Through modifying our own operations and encouraging our suppliers to do so, we consider the social, environmental and financial impacts of each of our creations throughout our supply chain. We are joining our industry peers in global initiatives that drive corporate responsibility throughout the watch and jewellery industry. This statement is made pursuant to Section 54 of the UK Modern Slavery Act 2015 and sets out the steps Chopard has taken to ensure that slavery and human trafficking is not taking place in our supply chains or in any part of our business. Learn more about the UK MODERN SLAVERY ACT.